I have had a lot on my mind this summer about what I want to change in my classroom next year so I decided to make a Thinking about Thursday linkup. The purpose of it is to make a post about things you are pondering at the moment. It can be anything from how to decorate your classroom, how to teach a certain subject or what to eat for dinner! Then add your post to the linkup for other people to see and give you ideas on whatever you are pondering. 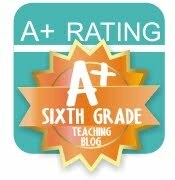 I am currently thinking about how I want to set up my language arts classroom next year. After reading The Book Whisperer I really want to change the way I teach to better benefit my students. I will be hosting a book discussion on The Book Whisperer tonight at 8 p.m. EST. 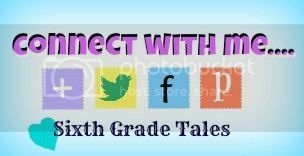 If you've read it or haven't and are interested in how you can change your language arts class then join us on my blog tonight for a live chat. I'm also thinking about some good summer reads for myself that have absolutely nothing to do with teaching. I need to take a break sometimes! Any suggestions? I also wanted to participate in Throwback Thursday! This post came from last year before I first started teaching. It is about the book In the Middle, which really relates to The Book Whisperer. 1) An idea to introduce students to the classroom is to provide a scavenger hunt of classroom supplies instead of just pointing them all out to them. 2) Require students to write a letter to me at least once a week about what they are reading and then reply back to them. I will be making sure that each student has a one subject notebook for this purpose. 3) Nancy Atwell structure her daily schedule to include a writing workshop and a reading workshop everyday. I most likely won't have the time for both but I do like the idea of having word work as a bellringer, followed by a mini-lesson and then either a reading or writing workshop which I can alternate each day. I also like how she emphasizes the importance of read alouds which I think I will end each day with. 1) Make a blog post about what you are pondering. It can be about anything that you want people to give you advice about. 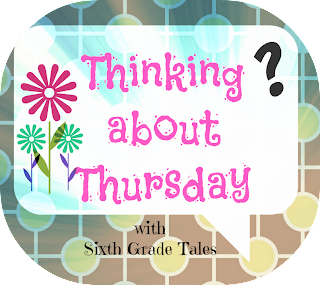 2) Add my Thinking about Thursday button to your blog post. 4) Visit at least two blogs before yours and comment on them. Have a great Thursday and happy linking! I loved The Book Whisperer! I read it last summer along with my 4th grade team and it really changed all of us. Your linky party sounds very cool. I'll have to remember that for next week! I like the idea of your students writing you a letter. My fifth grade teacher had us write to her in our reading journals and I remember enjoying her responses. :) I wonder if I could adapt that for my little people? I may have to try it! I read In the Middle a couple of years ago, and she influenced the way I teach reading a lot. I had students use journals this year - the give and take of their writing and my responding was fun, although three classes worth of journals (one class was due on Tues., one on Wed., and one on Thursday) was a lot each week! But it was good. This year I think I'm going to have individual meeting with my kids instead. Not sure about journals. How did the chat on Book Whisperer go? I wasn't feeling well and fell asleep on the couch. I'm sorry I missed it!